1) Create a Temp folder on your hard drive. Name this folder: B&W2_DVD. This will be the name (Label) of our DVD. 3) From CD2 copy the ‘data3.cab’, ‘setup2.mhs’, and the ‘suppress_explorer.exe’ files to the same Temp folder. 4) From CD3 copy the ‘data4.cab’ and the ‘setup3.mhs’ files to the same Temp folder. 5) From CD4 copy the ‘data5.cab’ and the ‘setup4.mhs’ files to the same Temp folder. 5) Create another folder inside the (B&W2_DVD) Temp folder. 6) Copy all the contents from the Battle of the Gods CD to the BOTG folder. 7) Create another folder inside the (B&W2_DVD) Temp folder. 8) Put the Black and White 2 and Battle of the Gods Cracks inside this folder. Also put any patches/Updates in this folder. 9) Using the Notepad create a text file named ‘Serials.txt’ (without the Quotes). Paste the ‘Serials’ for both games into this text file and save it in the B&W2_DVD folder. 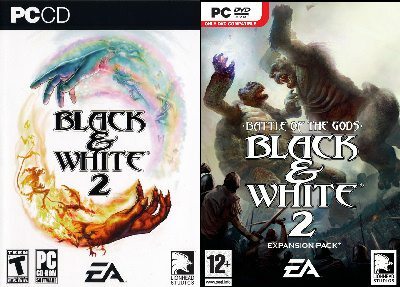 10) Download my Black and White 2 + Battle of the Gods Custom Install Menu from here. You can view the Custom Install Menu here.